Winter is the perfect time for parties and it is also the tome for celebrating the New Year. It is also the time when you need to take proper care of your skin and hair. When you have wavy or curly hair, it becomes all the more difficult to maintain it in winters. Here we will talk about various ways to maintain your curly and wavy hair and enjoy your party. 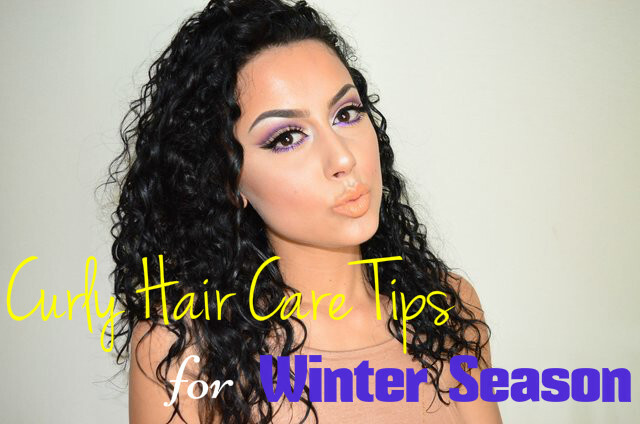 How to Protect Your Curly & Wavy Hair in the Winter? Drinking hot coffee and alcohol can negatively affect your body, skin and hair. They have the power to change the functioning of the liver and produce toxins by forcing the endocrine system. The toxins thus produced get accumulates in your body. This can make your skin and hair look duller. It can also cause pre-mature ageing of the skin and hair. So, instead of coffee and alcohol, you can drink tea to beat the cold. Green tea is considered best. You can also take-in lemon mixed in hot water. As the saying goes, prevention is better than cure. So, the best way is to avoid all conditions that can turn your hair fizzy. When you go out during the winter times, the dry and cold air outside can make your hair fizzy and dry. Make sure that you cover your hair properly when you go out in winters. Cover your hair with a scarf or a crocheted hat. Hats not only help in protecting your hair from the dry and cold winds, but also are a fashion statement. So, go out in style and keep your hair well protected. Oil, as you know, can work wonders on your hair and keep your hair healthy and lustrous. When you deep condition your hair in winters, always remember to include oil also in your treatment. You can warm the oil and then apply it on your hair. Warm olive oil, almond oil and coconut oil are great for your hair. You have to apply the hot oil on your hair and scalp before you wash your hair. Applying it before you shampoo your hair helps in keeping your hair soft and also makes it easier to detangle your hair. Let the oil stay on your hair for about 30 minutes or more and then you can shampoo your hair with a good quality shampoo. Oiling your hair also helps in adding coating to the hair. As a result, when you apply the shampoo on your hair, it won’t be as stripping to your hair. The best oil for curly and wavy hair is jojoba oil, olive oil and sweet almond oil. These oils are light and help you to control fizz. Have a good night sleep and remember to use pillows with satin pillow case. This is because satin does not absorb moisture from your hair like cotton. A good sleep is very beneficial for your curly and wavy hair. You may also warp your curls and waves in a satin scarf. This can also help in reducing fizz and providing you softer and smooth hair. When the winter comes, we usually drink less water than in summers as we feel less thirsty. But, water is essential for your body even in winters. By taking in more water, you can keep your skin as well as your hair in better condition. Your curls and waves benefit a lot from water as it helps in keeping them well hydrated. So, make sure that you take in lots of water in winter to prevent your hair from getting fizzy. If you have the habit of using hair straightness and blow dryers, try to use them as little as possible during the winters. If you use it often, these can make your hair more dry, fizzy and unruly. When the winter is accompanied with dry winds, the damage caused to your hair is increased. It makes your hair very dry and unmanageable. With lots of care and proper maintenance, you can keep then as beautiful as ever. Remember that curls and waves never go out of fashion. Curly and wavy hair is very porous. So, by conditioning your hair after every wash, you will be able to lock moisture in your hair and prevent it from getting frizzy. You can use a daily conditioner for wavy hair. Apply it and leave it for 2 minutes. Then you can wash it off. In case you have tight curls, let the conditioner stay on your hair for 5 minutes and then wash off with water. You may also use a leave-in conditioner on your tight curls if you prefer so. Remember to deep condition your hair twice a week to keep it healthy and in good condition. Honey is very beneficial when you use it with a conditioner that is fortified with olive oil and avocado oil. If you feel your hair to be too oily after conditioning, you can use a mild shampoo and wash your hair. Honey with its humectants properties, keeps your hair well moisturized, thereby preventing your hair from getting fizzy. You can use hair care products containing honey to keep your curls and waves in good condition during the winters. The above tips will help you to keep your curls and waves under control without much effort. Love your tresses and always keep them in good condition.